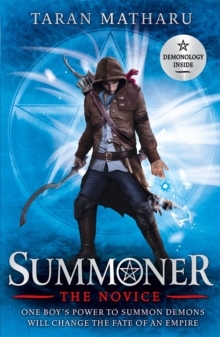 ONE BOY'S POWER TO SUMMON DEMONS WILL CHANGE THE FATE OF AN EMPIRE ... Demons, magic and epic adventure - introducing the first book in the New York Times bestselling Summoner Trilogy... Fletcher was nothing more than a humble blacksmith's apprentice, when a chance encounter leads to the discovery that he has the ability to summon demons from another world. Chased from his village for a crime he did not commit, he must travel with his demon to the Vocans Academy, where the gifted are trained in the art of summoning. The academy will put Fletcher through a gauntlet of gruelling lessons, training him as a battlemage to fight in the Hominum Empire's war against the savage orcs. Rubbing shoulders with the children of the most powerful nobles in the land, Fletcher must tread carefully. The power hungry Forsyth twins lurk in the shadows, plotting to further their family's interests. Then there is Sylva, an elf who will do anything she can to forge an alliance between her people and Hominum, even if it means betraying her friends. Othello is the first ever dwarf at the academy, and his people have long been oppressed by Hominum's rulers, which provokes tension amongst those he studies alongside. Fletcher will find himself caught in the middle of powerful forces, with nothing but his demon Ignatius to help him. As the pieces on the board manoeuvre for supremacy, Fletcher must decide where his loyalties lie.